American Red Cross, Washington, DC. To James H. Slover, Youngstown, MO. Re: Pvt. 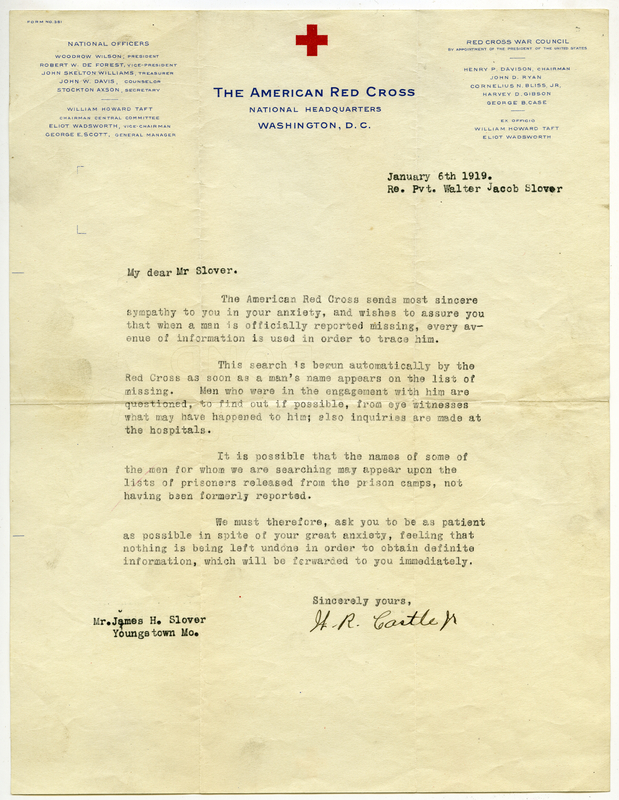 Walter Jacob Slover, Missing in Action. Courtesy of Pickler Memorial Library, Special Collections. Msv1_C. This search is begun automatically by the Red Cross as soon as a man’s name appears on the list of missing. Men who were in the engagement with him are questioned, to find out if possible, from eye witnesses what may have happened to him; also inquiries are made at the hospitals. It is possible that the names of some of the men for whom we are searching may appear upon the lists of prisoners released from the prison camps, not having been formerly reported. We must therefore, ask you to be as patient as possible in spite of your great anxiety, feeling that nothing is being left undone in order to obtain definite information, which will be forwarded to you immediately.